(CNN) - Mitt Romney's campaign has brought back a widely-discredited welfare claim in a new television ad, one week before Election Day. In the ad--which was unannounced by the campaign but posted Tuesday on Romney's YouTube site–the narrator lists the "gutting" of the work requirement in welfare as one of President Barack Obama's so-called failed policies in his first term. 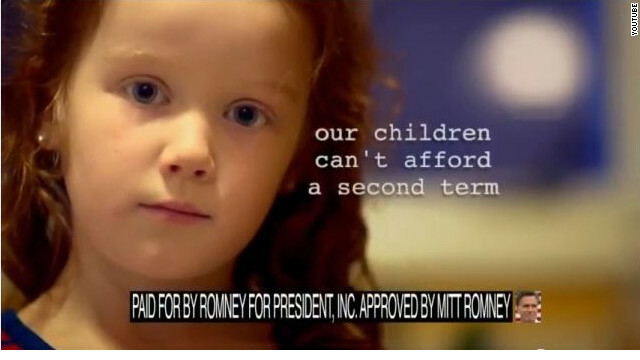 Along with high unemployment and a rise in food stamps, the Romney ad paints Obama as a threat to future generations. "We may have made it through President Obama's first term," the narrator concludes, as footage of children are featured on the screen. "It's our children who cannot afford a second." The ad, "Can't Afford Another Term," attacks an Obama administration directive that allows individual states–which have received a waiver from the Health and Human Services Department–to experiment with changes to their federally-funded welfare-to-work programs. The intent, according to the directive, is to "challenge states to engage in a new round of innovation that seeks to find more effective mechanisms for helping families succeed in employment." But it also requires a 20% increase in the number of people moving from welfare to work in exchange for more flexibility granted by the waiver. When Romney released a string of ads making the welfare attack this summer, an independent and non-partisan fact-checking organization, PolitiFact, rated Romney's offensive as "Pants on Fire." And the Obama campaign, the White House and former President Bill Clinton, who signed the original legislation into law, all hit back against the Romney spots, saying the claims were false and misleading. Obama campaign spokeswoman Lis Smith responded Tuesday night to the latest ad. "Mitt Romney's desperation has brought him back to his old welfare lie – showing once again that there's nothing he won't say to win this election," she said in a statement. "If the American people can't trust Mitt Romney's words in his campaign ads, how could they ever trust him with the presidency?" When pressed about the welfare ads in September by CNN National Political Correspondent Jim Acosta, Romney defended his campaign's commercials, saying they've been "absolutely spot on." "Anytime there's been anything that's amiss we correct it or remove it," Romney said in the interview. Romney's campaign did not respond to requests for more information about the new ad. According to CNN's ad tracker Kantar Media CMAG, the commercial has already aired in Colorado, Florida, Iowa, North Carolina, Nevada, Ohio, and Virginia. There's something a little strange about this Romney guy.Anyone notice? But but but...Mittens isn't desperate...oh no....please believe that he's super confident and that attack ads full of gross distortions and lies about welfare and Chrysler/Jeep don't indicate that he's running around with both his hair and his pants on fire!!!!! PLEASE PLEASE BELIEVE HIM AND THE MSM THAT IT'S ALL JUST TOO CLOSE TO CALL!!!! How's all that number one priority stuff workin' out for ya, Teatrolls? Willard continues his LYING ad campaign. This suggestion Willard keeps implying has been proven FALSE. All he does is LIE LIE LIE. Romneyu's desperation becomes mre clear with each baseless and ridiculous ad. Thankfullyt, on November 6, he will be sent home (to which one I am not sure). Bottom line, Romney is losing and it shows. Robmey/Boy Wonder want to get rid of FEMA...now this! Really? jkane sfl a vote for lady parts romney the tax cheat and lyin lady parts ryan willcut your moms medicare and soc sec . .can you afford to pay for them??? Just more lies from the lier in chief ,romney the never to be president ,at least in the USA ,try somila and tax lyin Ryan with you !!!!! Republicans are looking more and more desperate. There is no end to this man's lies. He is downright pathological. The re-airing of this false ad and the recent airing of the "Obama ships Jeep jobs to China" ad that even Chrysler was forced to come out and discredit support a narrative that Romney unapologetically is willing at this point to desperately throw anything out and see if it can sway someone into his camp ... has to make you wonder what we'll get if he's President and he's trying to sell us something that may be unpopular. I almost hope Romney wins, because after all the lying, cheating and revealing that he has no core values – I wouldn't wish the level of shame that will come from losing anyway on anyone. On the other hand, if we will elect a blatant liar and cheater with no core principles into the Presidents office, we as a nation have much to feel ashamed of. In reality, the country cannot afford a THIRD term for George W. Bush, which is what a W-omney first term would be. Do not fall for the nonsense Romney and the Republicans are selling. They will lie, cheat and steal to get into the White House. It doesn’t matter how Romney and the Republican try to spin their policies, the American people know how disastrous those policies have been for this country, especially for the Middle Class and less fortunate. Americans are not stupid. How can anyone even thing Romney’s policies will be better for this country. Romney and the Republicans policies from 2001 to 2008 brought this great nation to its knees, their policies caused the Great Recession, their policies wiped out almost 10,000,000 jobs as a direct result of the Great Recession, their policies wiped out retirement savings for tens of millions of Americans as a direct result to the Great Recession, their policies took a $1 trillion surplus to a $13 trillion deficit, their policies resulted in the decline in the percentage of Americans that are in the middle class, their policies resulted in tens of millions of Americans without healthcare, their policies resulted in millions of Americans losing their homes, their policies will be detrimental to Latinos and all other minorities, their policies will result in another war in the Middle East, and the list goes on. No Americans in their right mind will believe that Romney/Ryan policies will be better for the Economy. The only way for anyone to think that is if they are suffering from total amnesia. People will remember what happened in 2007/2008 and the years leading up to the Great Recession. It was the exact same policies that Romney is advocating now that caused the Great Recession. We are not that dumb to think that these same policies that caused the Great Recession will somehow magically make the economy better. He told us in his 47% video that he'd "take advantage" of a tragedy. He meant it. Thus the "relief stunt" photo-ops staged by R+R in Ohio and Wisconsin this week while the rest of us (in actual disaster areas!) wait for real help from those who actually care and know what to do. HOW CHEAP CAN YOU GET....?? ?WHEN ALL ELSE FAILS TURN TO USING CHILDREN AS A TOOL!!!... DO THE CHILDREN COUNT IN THE 47% OF USELESS CITIZENS OR DON'T THEY REALLY COUNT AT ALL........EXCEPT TO USE AS BAIT?? ?THIS MAN HAS NO CHARACTER NOR DECENCY AND WILL USE ANYTHING HE CAN!! You politicians keep the country moving in the right direction and WE will take care of our children,,,thank you!!! Yah let do it like all the RED STATES ran by REPUBLICAN governors who frankly are the poorest among us. Their answer, continue voting Republican. His is shameless and godless and greedy! LIES! Put the lie out there and then run and hide so you won't have to respond to it. America has not moved forward as far as race relations. To think in this day and age the people would support a tax evader, a liar, draft dodger corporate raider instead of a man that has been working to help people all of his life (community organizer if you don't know the meaning) with integrity. The color of his skin should not have anything to do with his character or his heart, but you have people who will blindly vote for this immoral Mitt Romney because they hate the president and anyone like him. More lies from Rmoney. Spread false statements and then deny everything. The Repukes must think we all live in the southern states and have a limited amount of teeth in our heads. Poll numbers are sinking like a rock...what to do? Now it's "welfare, welfare, welfare!" Obama gutted a welfare policy that was working just fine. He did it for political points with his base. This is not a guy we need making decisions. These are not in the best interest of the country. If Romney was really winning this race why put out ads that are absolutely false. Everyone with a ioata of an open mind knows that the ads about changeing the welfare laws and Chrysler moving American jobs to China are complete and utter lies. If Romney was President today NJ would have to come up with billions of its own oney to clean up after the hurricane. They don't have that kind of money and would have toget it from the federal government. "When Romney released a string of ads making the welfare attack this summer, an independent and non-partisan fact-checking organization, PolitiFact, rated Romney's offensive as "Pants on Fire." It is tempting to question Mormon religion but I know there are so many decent people who happen to be Mormons. Romney is some kind of a breed. How a man can be devoid of anything that makes a man a human being? All politicians stretch the truth sometimes but has anyone ever seen a politician like Romney who just lies as brazenly as he does without caring that what he has said previously is on tape. I mean this guy takes lying to a new height. The good thing is that he is going to bring the rest of the GOP who probably hates Romney along for the losing ride. Christie knew enough not to buy into Romney by not going for the VEEp spot and by giving a lukewarm speech advocating for Romney at the convention.